For this line, you can visit all the famous scenic spots in Zhangjiajie. And you can enjoy the beautiful spectacular of Tianmen Mountain! Day1：Meet the group in Zhangjiajie and visit Tianmen Mountain, Tianmen Cave. All-day：We will go to the down station of Tianmen Mountain cableway and visit theTianmen Mountain national forest park. The entrance fee is 258RMB/P which is included. It takes about 28minutes to take the cableway. The mountain winding bus road of Tianmen, and there is 99 sharp crooks. Mountain is worth the title of world-shocking masterpiece. It brings shocking and unforgettable experience for the tourists. Tianmen Mountain cableway, the longest one-way recycling passenger cableway in the world, has a length of 7455 meters and a height gap of 1279 meters. Glass Plank Road is located on the top of Zhangjiajie Tianmen Mountain，west road, length 60 meters. (Please attend: If you want to walk on the Glass Plank Road, you need to buy the overshoes by yourself.) The highest elevation is 1430 meters. 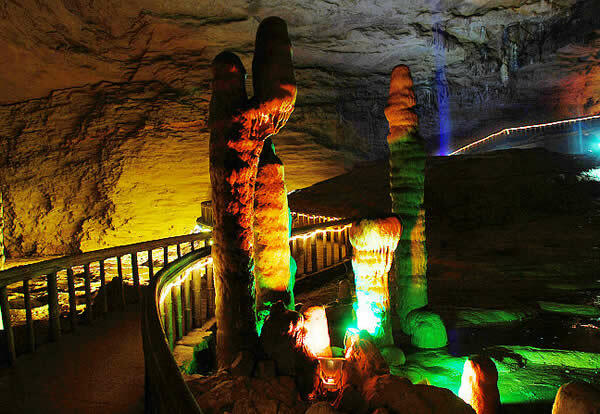 It is another special attractions in Tianmen Mountain scenic area. Along the way to the top of the mountain by cable car, you can see the landscape transforming into a kaleidoscope, experience a miraculous feeling of flying angels in the sky as well as of being blended into a long grand painting of landscape. On the top of Tianmen Mountain, we can visit by foot or take the small cable car which it needs to pay 25RMB/P for one way or 39RMB/P for round way. It needs to pay for it by yourself. Four great scenic areas in Tianmen Mountain:Tianmen Cave scenic area,the Buddhist Heaven scenic area,Find Fairy Wonderland scenic area and Green Field scenic area. Accommodation ：Live in Zhangjiajie city. In the morning：The travel car will go to the first national forest park―The National Forest Park of Zhangjiajie. It needs to take about 40minutes by car arrive there. The entry fee is 245RMB/P plus 3RMB/P insurence fee. After we enter into the park, we can see the big oxygen bar square( including 8-10 million negative oxygen ions per cubic centimeter of air). When we land at the altitude of 1200 meters, we can see the biggest sightseeing stand in Zhangjiajie. And then we will visit the Yellow Rock Village scenic area. We can choose to take the cableway up and down and can also walk up and down. If you take the cableway that needs to take 65RMB/P one way and 118RMB/P round and you need to buy the cableway ticket by yourself. Yellow RockVillageis the most important spot in Zhangjiajie National Forest Park. It was highly praised by a famous poet: “It makes us surprised in five steps, astonished in seven steps and shocked in ten steps.” And now, let us enjoy the beautiful. Walk along the way, we can see the Six Wonders Pavilion, the Star-Plucking Terrace, the Five Fingers Peak, the Natural Mural, the Echo Wall and so on. In the afternoon：We will visit the most beautiful grand canyon in China―The Golden Whip stream: which is also one of the most beautiful valleys all over the world and needs to take 2.5 hours for trip. It is honored with ever-flowing spring in 1000 years’ drought and ever-green water in 10,000 years’ raining. The whole valley is7.5 kmlong. It includes some spots, for example, Gold Whip Rock, Legendary Eagle Protects the Whip and so on. The Golden Whip Brook is just like a blue scarf around the beauty--- Zhangjiajie. The path winds along mountain ridges and birds sing and flowers give out fragrance. And it makes the mountains and waters show out “three thousand unique peaks and eight hundred clean waters”. And finally, we will visit the Ten Miles Gallery, which is one of the most beautiful ten spots. Finally, we will take the car to the Biaozhimen. In the afternoon：We can choose to walk down the mountain. (Generally, it needs to take about 2hours by foot.) Or, we can choose to take the Tianzi Mountain cableway to down the mountain. (It needs to take 72RMB/P one way and you need to buy the ticket by yourself. 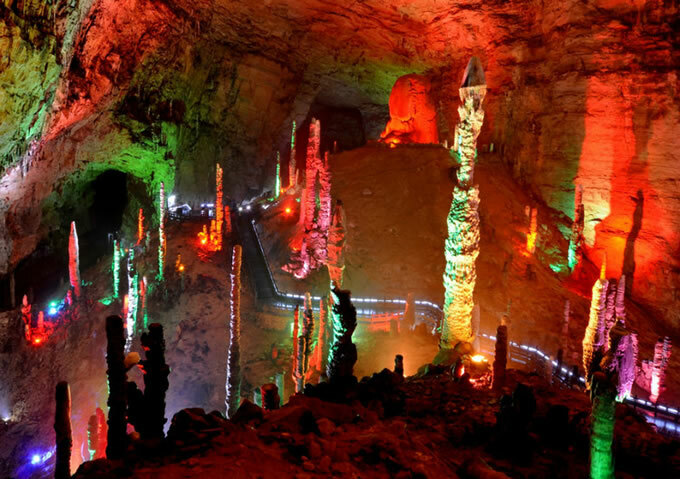 )?In the bottom of the Tianzi Mountain, we will visit the Ten Miles Gallery scenic spot. In the Ten Miles Gallery, we can sight it by foot that needs to take about 1hour. Or, we can take the sightseeing train. (The train is 38RMB/P one way and you need to buy it by yourself.) Along the way, we can enjoy many attractions, for example, the Three Sisters Peak, the Old People of Gathering Herbs, the Tigers Roar to the Sky, the Xiang King View the Book and so on. And then, end the trip today and we can back to the hotel and act freely. Day4：Visiting the Yellow Dragon Cave with the reputation of " champion cave of world tour " and ending the itinerary.